With another new year comes an opportunity to establish a set of resolutions and goals that are going to make you a more productive, better, and happier person. You’re probably thinking this is just another year where you are going to have some lofty ambitions that will be forgotten by March, but it doesn’t have to be that way. Often success is more likely to be achieved when you effectively utilize all of the tools at your disposal. 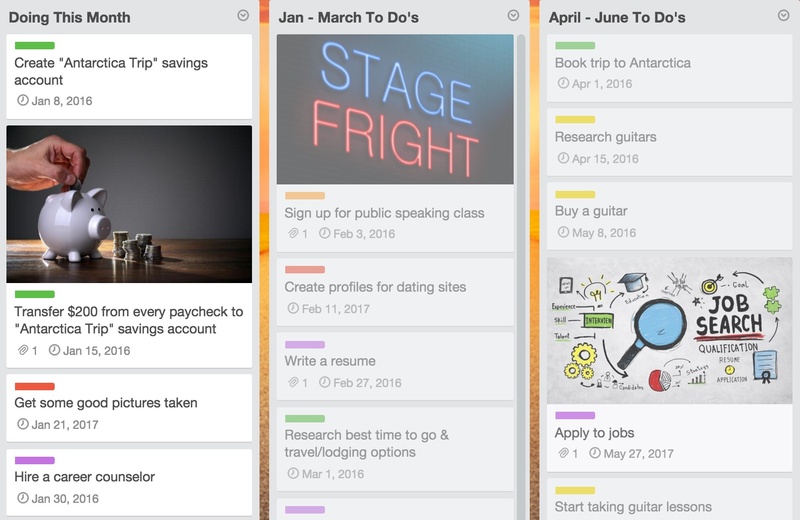 Trello is a great way to organize all of your resolutions and goals by identifying the tasks and steps required to achieve success and setting them into an actionable plan. Here are some tips and tricks to maximize the effectiveness of your resolutions. 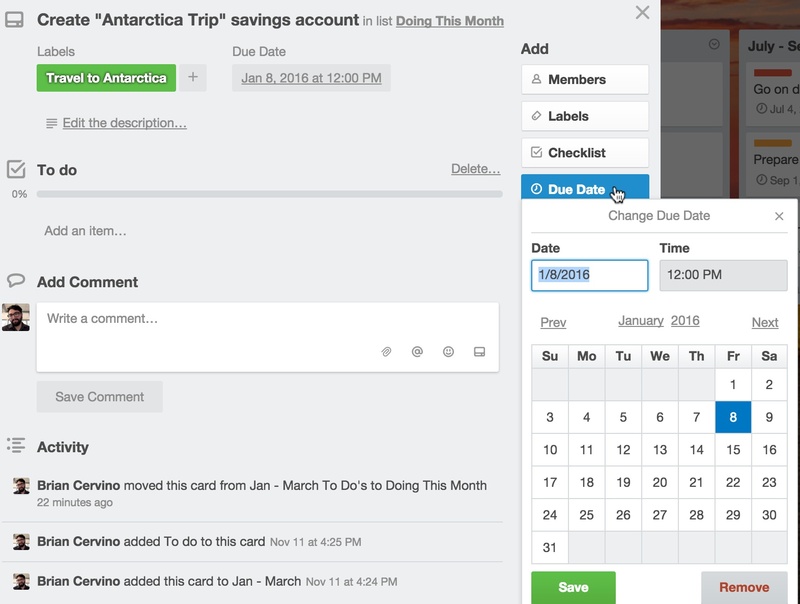 We’ll even show you how a Trello board can keep you accountable and on task. Check out the New Year’s Resolutions board. The leftmost list has a card with each goal, and on each card is a checklist that represents the steps towards achieving it. Every goal has a card in the leftmost list. On each “goal” card there is a checklist for each step required to achieve that goal. Every step, or checklist item, has a corresponding card that includes a due date and more detailed information about that step. As a card’s due date approaches it moves into the “Doing This Month” list. When a step is completed, the card is archived and the corresponding checklist item is checked. Empty lists get archived as well. At the end there is one list left and all checklists are complete! 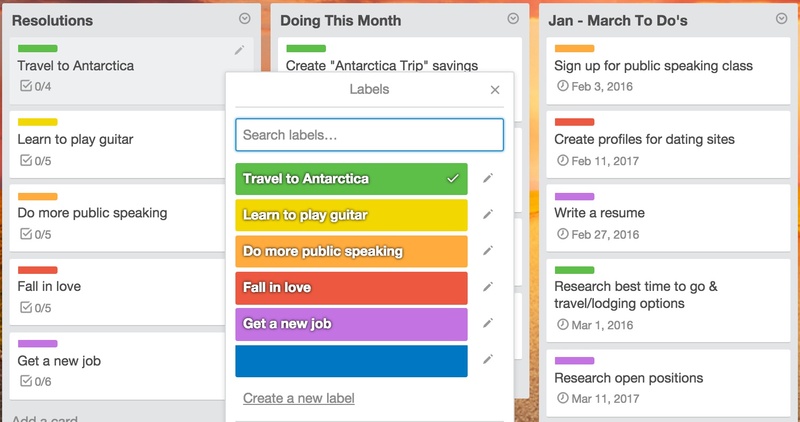 Use labels to associate tasks with your resolutions. Create a label for each resolution and apply them to cards so that you can quickly surface tasks associated with a resolution. Utilize grey labels for additional tagging possibilities. Create tags to sort personal and work goals, or to indicate how long a task might take (for example, “1 week,” “1 month,” or “3 months”). No great goal is easy to achieve. Often there are many steps involved when getting from point “A” to point “Yay.” Create checklists on cards to organize subtasks and stay focused. If a checklist item becomes a bigger project than you thought it was going to be, simply convert it into a card. Need to reorganize your steps to success? Drag and drop checklist items to keep your stars aligned. Resolutions are nothing more than lofty ambitions without establishing a timeline for achieving your goals. Add due dates to cards to make sure that you have an achievable plan of action with concrete deadlines. Trello will even send you a reminder 24-hours before a task is due when you are subscribed to the card. So when you get a notification for that cover letter you haven’t started writing yet, it’s time to conjure up your inner Asimov and start writing. Ahead of schedule and want to bump up the due date on one of your cards? 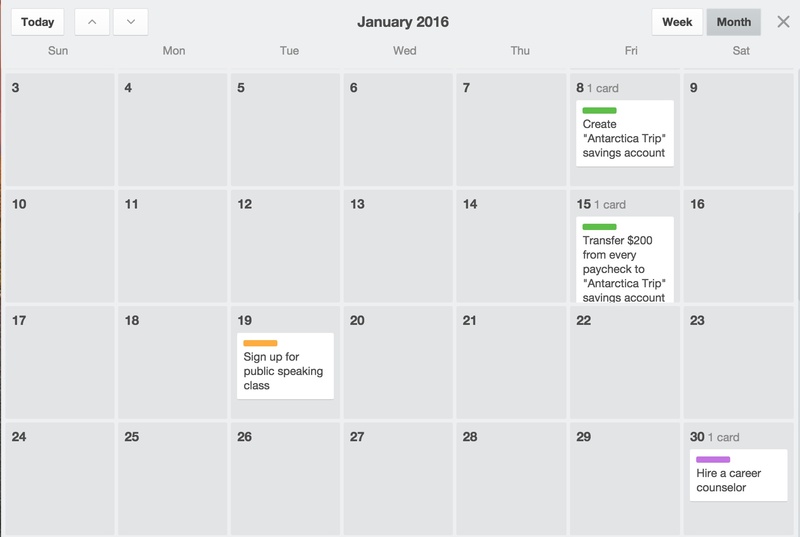 Just drag and drop the card to a new date on the calendar and the due date will be automatically updated. Take advantage of the iCalendar feed for your calendar by importing it into your favorite third party calendar apps and use the board filter function on your calendar to surface specific tasks by resolution. Read more about the Calendar Power-Up here. Another Power-Up to consider enabling is Card Aging. With the card aging Power-Up enabled, cards will slowly fade to grey if there is no activity on them. This is a great way to see in a glance which of your resolutions are not getting the attention that they deserve. Vision boards are a really popular way to create a visual representation of resolutions and goals. 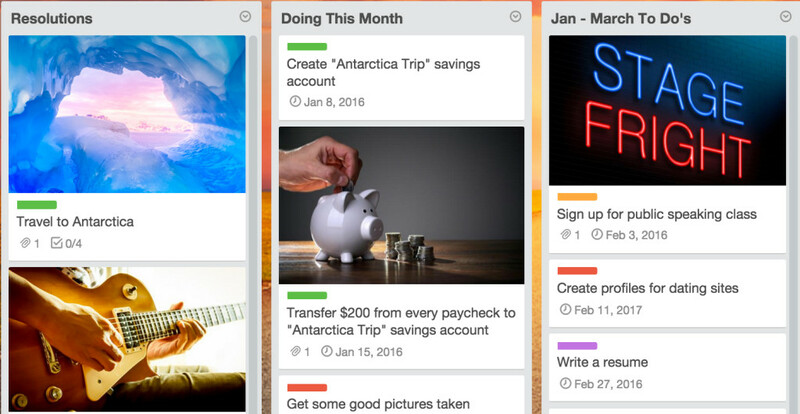 Turn your Trello board into a vision board with card covers. Either attach a file to a card from the card back or simply drag and drop an image onto a card (by default the image will be displayed as a card cover). Want to add a little extra pizzazz to that vision board? Animated .gifs that are less than 300 pixels wide will animate as card covers. Perhaps one of your resolutions is to get a new job and start living your dreams. While cruising the net you see some great tips for writing a knock-em dead resume that you would like to reference later. 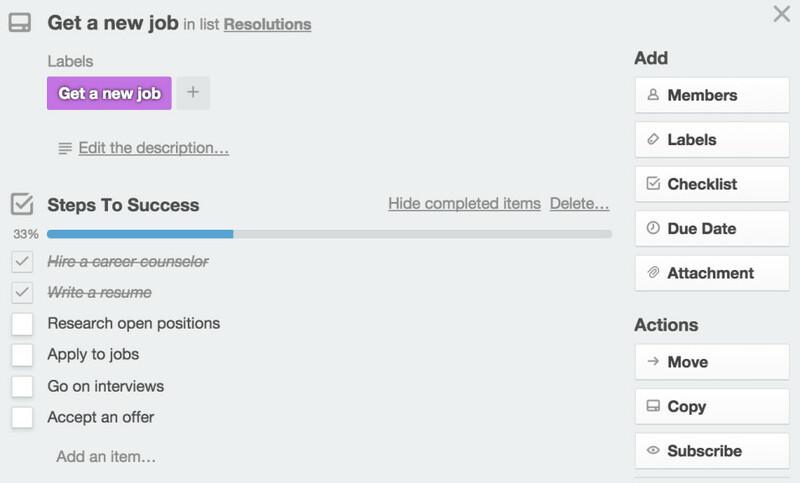 Simply drag and drop the link onto your “Write a resume” card to attach it and get back to surfing. Access your resolutions board and keep up with your tasks from anywhere with our mobile apps for iOS and Android. Is eating healthier one of your main objectives this year? Don’t get lost in the supermarket, winding up with another bag of chips in your cart. Access your healthy eating recipes and grocery lists that you’ve been collecting on your board, and instead of feeling guilty you’ll feel good about sticking to your resolution. Sticking to resolutions and achieving goals is no small task, so don’t do it alone. Add friends, family, your life coach, or anyone else to your board that will help keep you on track. Set up weekly or monthly check-ins by having your confidants leave comments on cards to make sure that you are staying on top of things, or see if you need to talk about any roadblocks that have come up along the way. Need some advice? 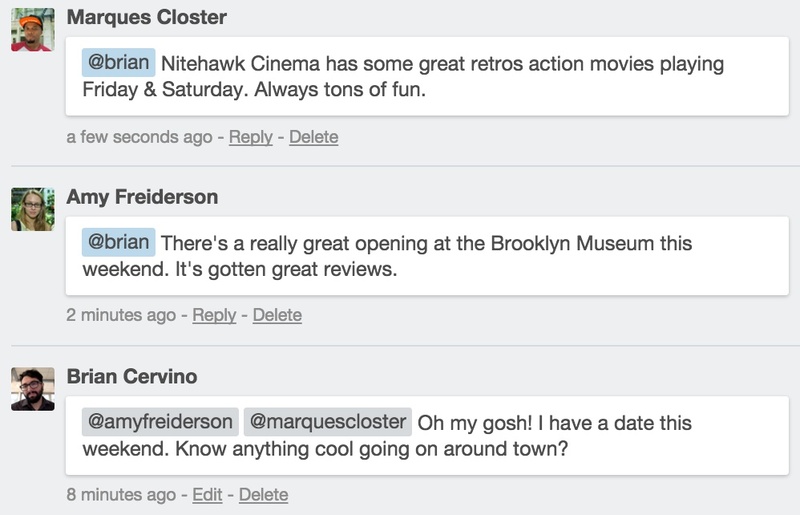 @ mention someone on your board in a comment to send them a notification so that they can hop in and help out. At the end of the day, the most important thing is that you develop the workflow that is going to help you achieve the resolutions that you set out to accomplish. 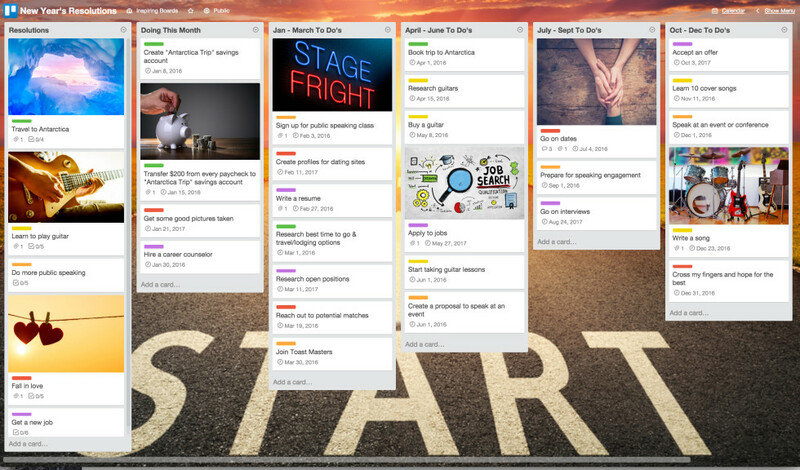 Don’t be afraid to change up your Trello board if something isn’t working, because there is no wrong answer. Do what makes sense to you.